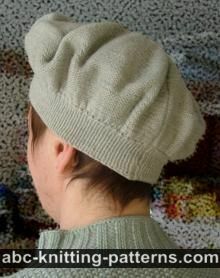 The hat is worked from the top down, in-the-round, without seams. 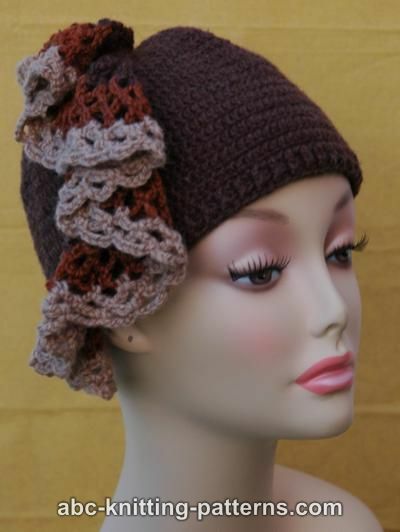 The ruffle is crocheted separately and sewn to the hat. Round 1: dc in each stitch across. Chain 6, join into circle with slip stitch (sl st). Round 6: ch3 (counts as 1 dc), work dc to the end of the round, join with sl st. Round 8: ch3 (counts as 1 dc), work dc to the end of the round, join with sl st. Round 10: ch3 (counts as 1 dc), work dc to the end of the round, join with sl st.
Rounds 12-13: ch3 (counts as 1 dc), work dc to the end of the round, join with sl st.
Rounds 15-25: ch3 (counts as 1 dc), work dc to the end of the round, join with sl st. If you want deeper or shallower hat, change the number of rounds above. Round 25: ch 2 (counts as 1 dc/bp), *1 dc/fp (front post stitch), 1 dc/bp (back post stitch), repeat from * to the end of the round, join with sl st.
Rounds 26-27: repeat round 25. Row 1 in MC: ch 1, 1 sc in the second chain from the hook, ch 6, * 1 sc in the next chain, ch 6, repeat from * to the end of the chain. Row 2: *ch 8, 1 sc in the next ch-6-space, * ch 6, 1 sc in the next ch-6-space, repeat from * to the last ch-6-space. Work rows 1-3 in MC. Weave in all yarn ends. Block the ruffle. 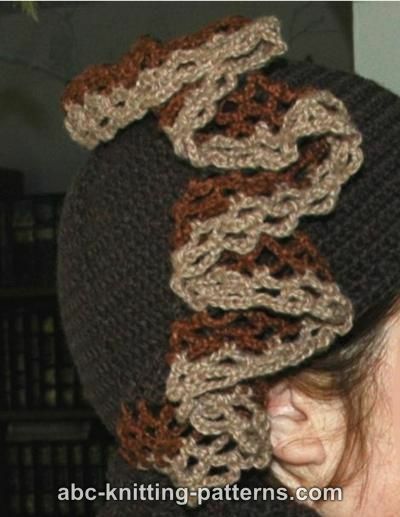 Sew on the ruffle on the side of the hat (see pictures). I love this hat but can't seem to follow your directions very good. This is what you have. Crochet chain 10, connect into circle. Rounds 3-10: dc, add 7 sts evenly in every round. There should be 80 sts in the 10th row. Rounds 25-26: Single Crochet rib. Tie off. You replied to another person to chain 3 after you joined with slip stitch. You can start from ch 8, if 10 seems to be large. Yes, you should slip stitch to connect each round and ch 3 at the start of each round. To use thicker yarn, you'll probably need less rounds. Anyway, it is possible to try the hat on to make sure it is the correct size. Thank you for the clarification. I haven't been crocheting very long and appreciate the additional information. I just finished this hat using a worsted weight merino wool/cashmere/microfiber yarn, size D hook, and didn't slip stich or chain at the end/beginning of the next round, just worked in a spiral. I wanted a smooth transition between rounds and no noticeable line where the rounds connect. Use a stitch marker for the end of each round. 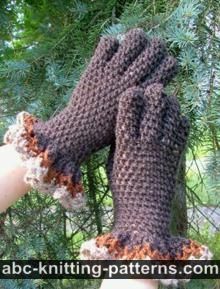 It would be easier to count stitches if the increase was 6/row rather than seven. Because of the worsted weight yarn, I eliminated the last six rows of double crochet,and the hat fits fine with two rows of the crochet rib. For the ruffle I did the first row in worsted weight then three rows of a variegated mohair. It looks fine. I made this as a chemo cap for a neighbor. Repeat round 1 for row 26. 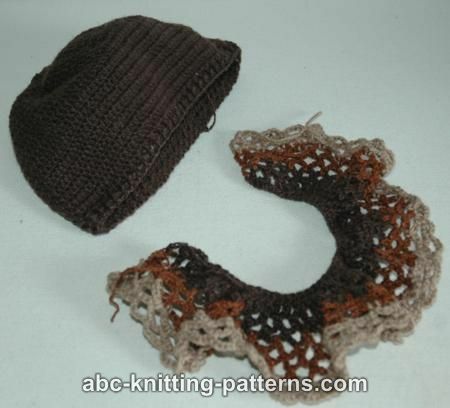 In other words - alternate 1 front-post double crochet and 1 back-post double crochet all the way around row 25 which will give a ribbed effect, then repeat the same pattern for row 26. Do you always chain 8 at the end of each row, even when changing colors? 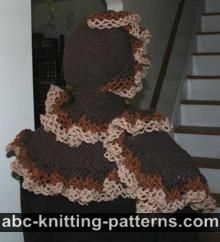 I don't understand the Single Crochet Rib instructions. It says to double crochet on row 1 and then row 2 also has dc/rf (around front) what does this mean? Only dc in the front - then it says dc in back? Also says repeat row 2 when there are only two rows (rows 25-26)?